For those who don't wish to flout the rules, walking up the track is long (4km!) but not particularly arduous, and quite pleasant. A reasonable pace should see you at the lower of the two crags comprising the sector (Indian Summer) in 50-55 minutes. There have also been access changes to the alternative approach to the sector from the north: the owners of 'La Serra' farmstead, through which the approach described in Lleida Climbs goes, have erected a large metal gate barring the way and made it clear they do not wish people passing through their property. Fortunately, it is possible to re-join the original path by using the track which forks rightward from the main track some 1.3km after the village of Romanins (and 600m before the the metal gate barring access to La Serra). Follow the track past farm buildings (no signposts) to reach the streambed. Here, at a sharp right-hand bend (just before reaching the Font de Codonyes) a path marked by a large cairn cuts off to the left. Follow the the path uphill past numerous cairns to wear it levels out, and then continue until reaching the original approach at the Figols / Font de Cordonyes signpost. Turn right and follow the original approach information as described in Lleida Climbs. The approach time is slightly longer than the original way (30-35 minutes) and the lack of parking areas near the start of the farm track (their are better places several hundred metres lower down) will add a few minutes more. Note: Since the publication of Lleida Climbs second edition in 2013, the number of climbs in Sector Xapat has almost doubled. Revised topos will be published in the next edition of Lleida Climbs (planned for Autumn 2019 release) but in the meantime info can be found in the bar 'El Portal' in Organyà. 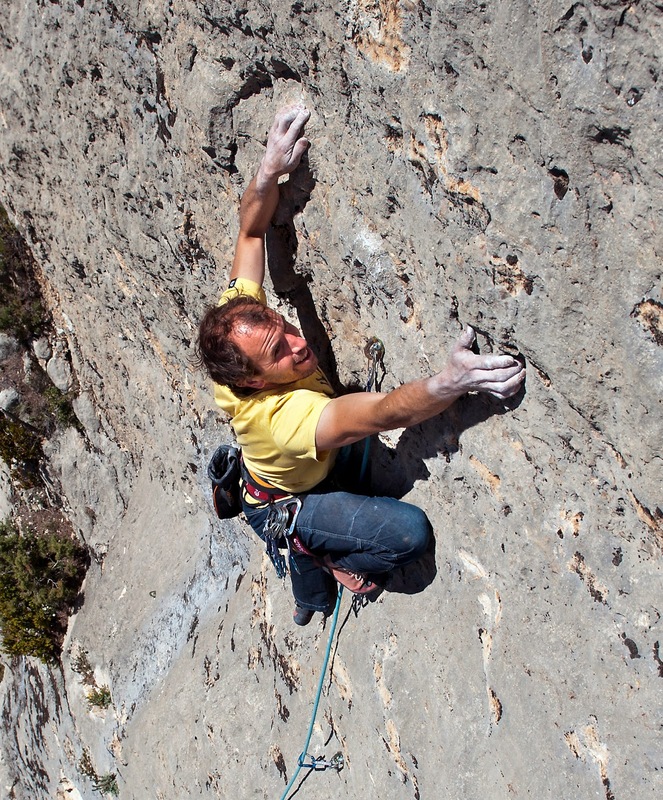 Edu Vendrell has informed us about a number of new climbs he and his friends have equipped in Camarasa. 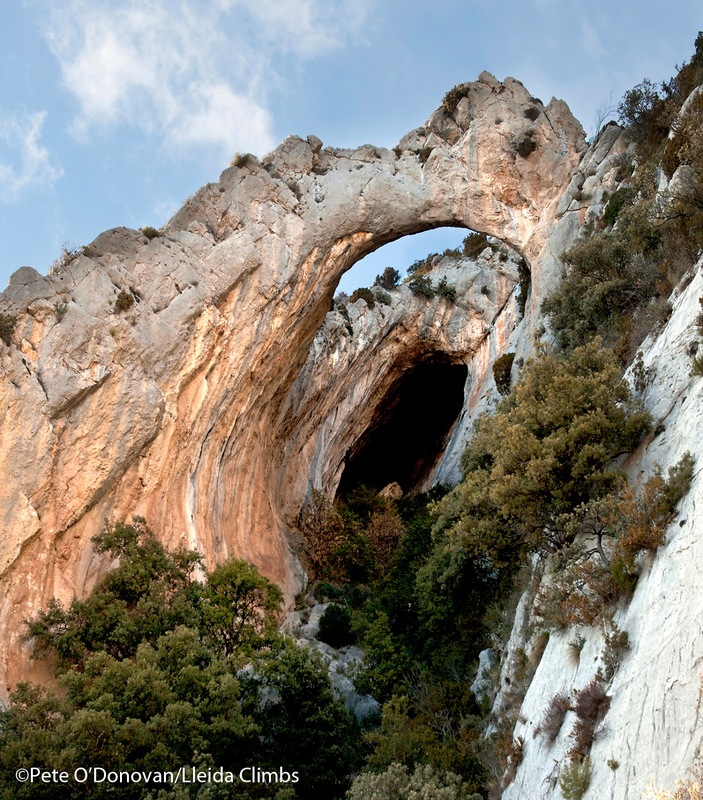 1) Sector Emotion — situated between sectors La Blanca and Kuestelon la France. 2) Entre Dexter i Fashion — situated midway between sectors Dexter and Fashion. 3) FKuestelon — situated just right of the right-hand end of Kuestelon la France. 4) Les Bessones — A prominent pinnacle situated to the right of Kuestelon la France and higher up the gully. All routes equipped by Eduard Vendrell, Xavier Martínez and Xavier González. 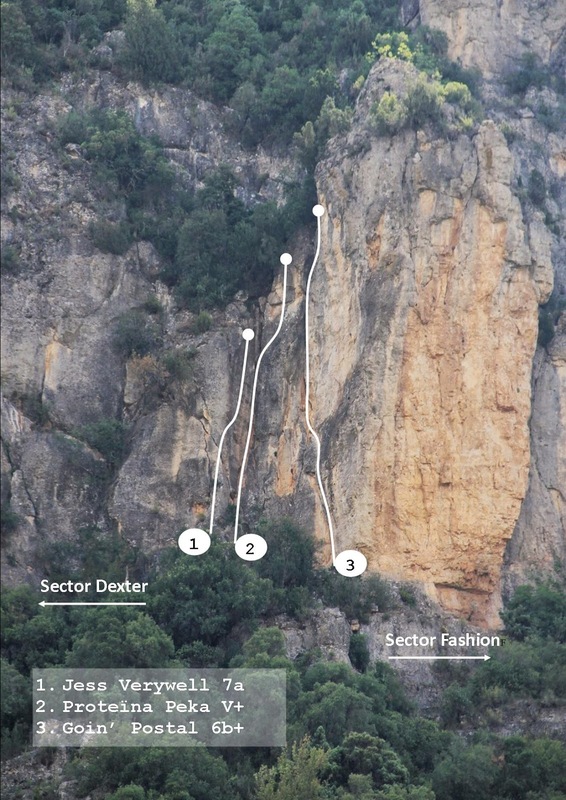 A major new sector has been equipped on the northern side of the gorge, approximately 200m to the left of Sector 'El Solarium' (not in Lleida Climbs). 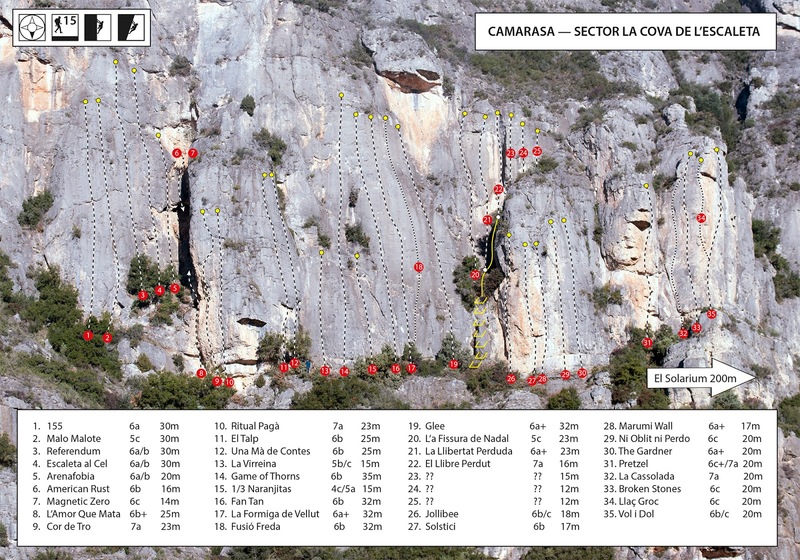 The new sector is called 'La Cova de L'Escaleta'. 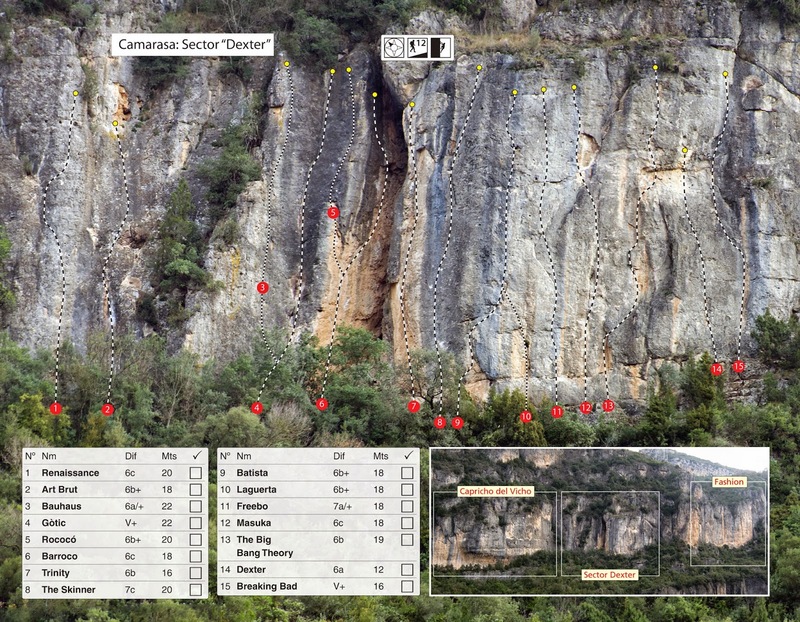 It is south-facing and currently has 35 climbs, mostly in the 6a-6c range. 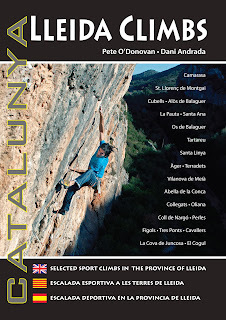 The sector was equipped by Pete O'Donovan, Albert Cortés and Tom Zappe, with help from Andy Gardner and the kind donation of 12 lower-off units by David Tarragó. 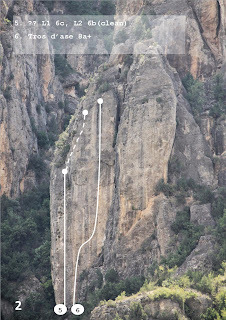 The line shown in Lleida Climbs for the route 'Eclipse' (page 97 in LC2) is actually a direct variation known as "Variant Boira". This is considerably harder than Eclipse 'original' (7a if done completely free) but is fully equipped with parabolts and rappel stations and is possible to ascend at V+ if a number of bolts are used for direct aid. Consult the topo below with pitch grades for the "Variant Boira". 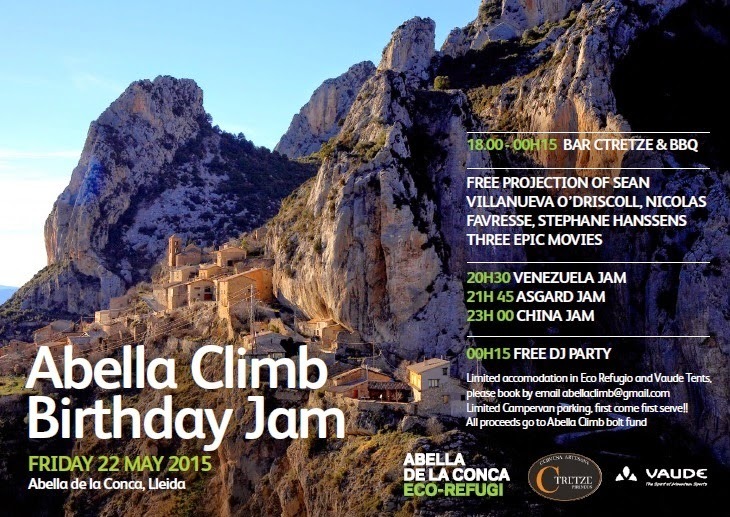 Abella de la Conca — Birthday Jam! 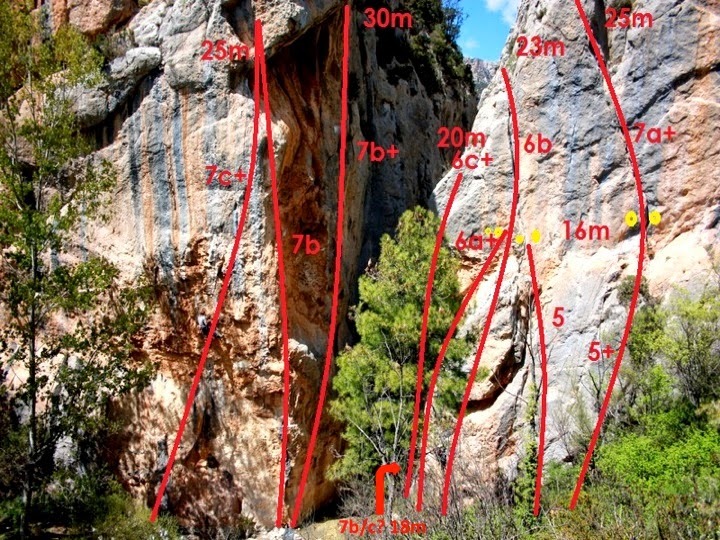 UK climber Steve Crowe (a regular visitor to Catalunya) has informed us that, due to the presence of a rare species of plant, three of the classic hard routes in Tres Ponts have been 'banned' by the authorities. These are: El Segre (8a), Els Inconformistes (8a+) and L'Alternativa (8a+). Apparently "Signs at the crag detail the plant species and location. Bolts and perma-draws still in-situ for now." 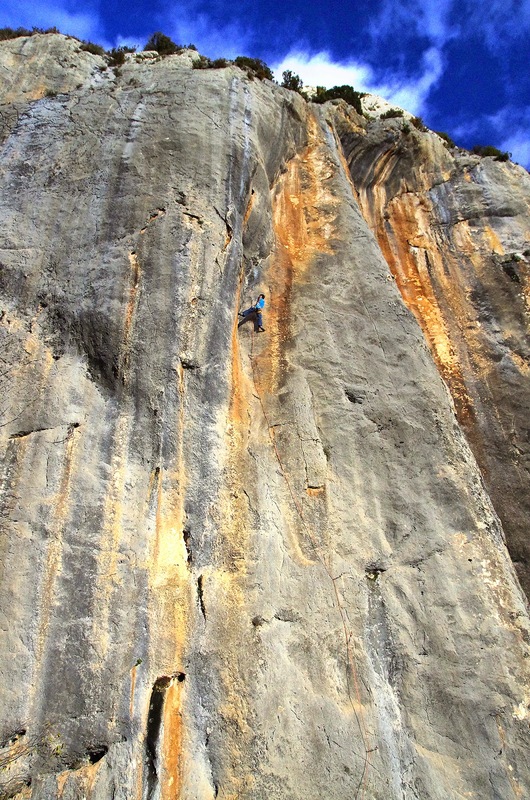 El Diedre 8b — Climbed by Klemen Becan! 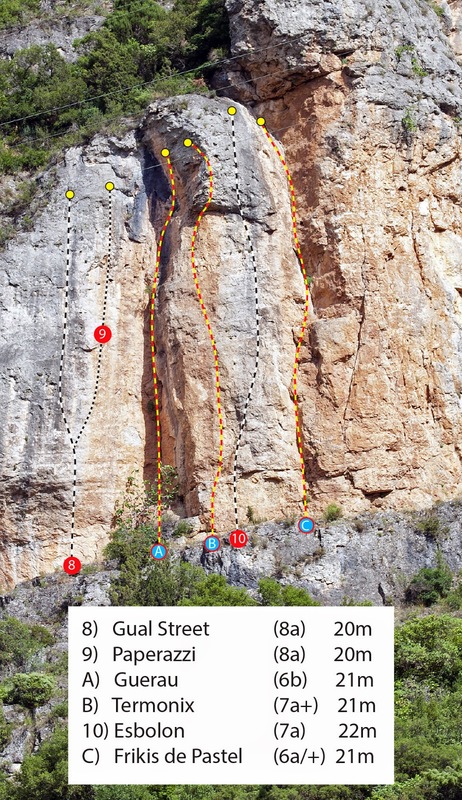 The brilliant Slovenian climber Klemen Becan has finally made the first redpoint ascent of El Diedre (8b) on sector Mur Blau in Abella de la Conca. 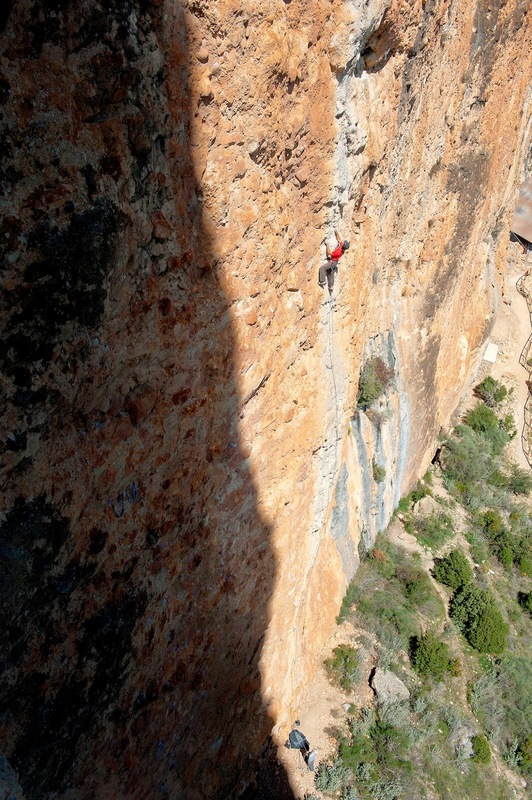 Although 8b is not exactly considered 'cutting edge' by today's standards, El Diedre is something rather different. This 50m pitch follows a superb line on barely vertical rock, featuring a 35m 7b+ 'warm-up' to a chain, followed by a virtually hold-less and desperately technical 15m bridging groove to the top. 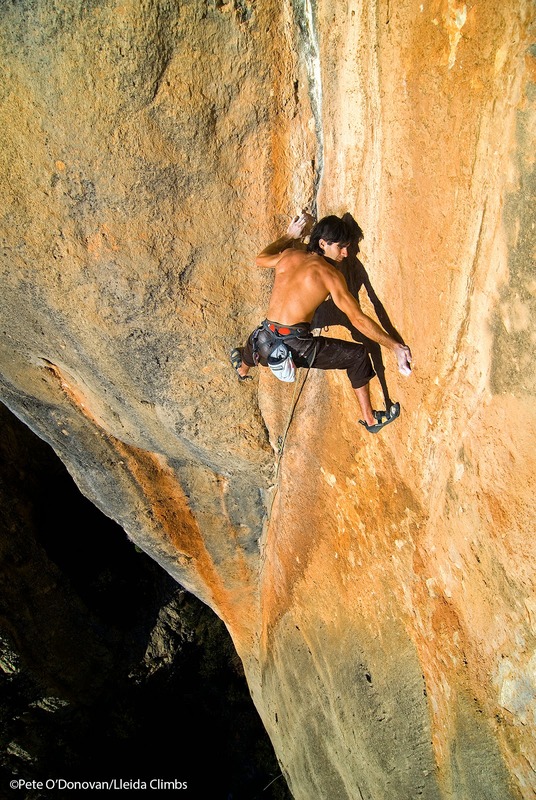 Klemen originally tried the route in 2007 together with Dani Andrada, and both got very close to success, only to be thwarted by the final few tenuous moves. Others have tried since, including Britain's Steve McClure, who came agonizingly close to the on-sight in 2013. 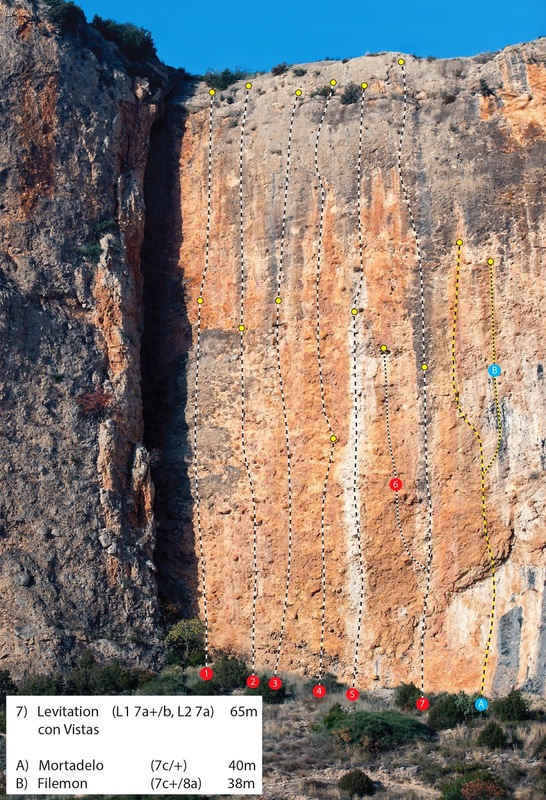 Klemen's ascent comes the day after he climbed the 50m power and stamina fest Mind Control (8c+) in Oliana, and is all the more impressive for that! 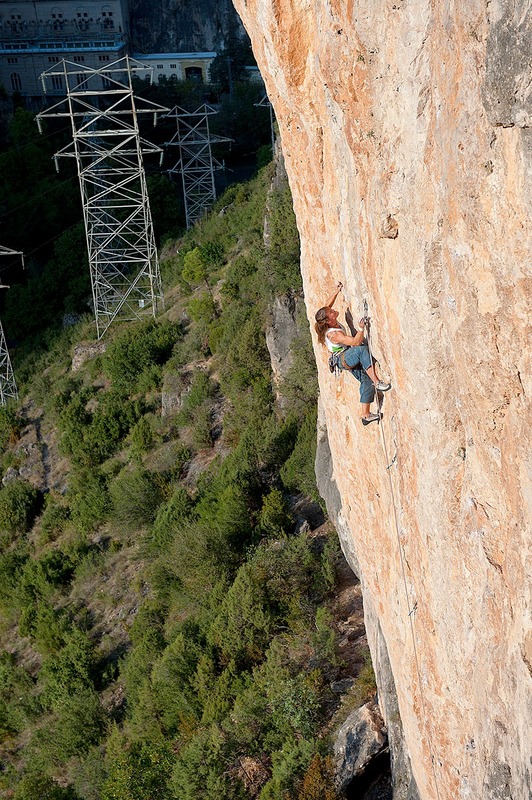 Klemen Becan on the FFA of El Diedre (8b) in Abella de la Conca. Dani Andrada attempting El Diedre in 2007, showing the extremely technical nature of the moves in the final groove. Watch Caroline Ciavaldini , Enzo Oddo, Kevin Aglae, Klemen Bečan, and James Pearson gathered together this summer in Abella de la Conca (Spain) for a climbing festival organized with Edelrid & Vaude. This recently rediscovered area has amazing limestone and offers all year round climbing for all abilities. 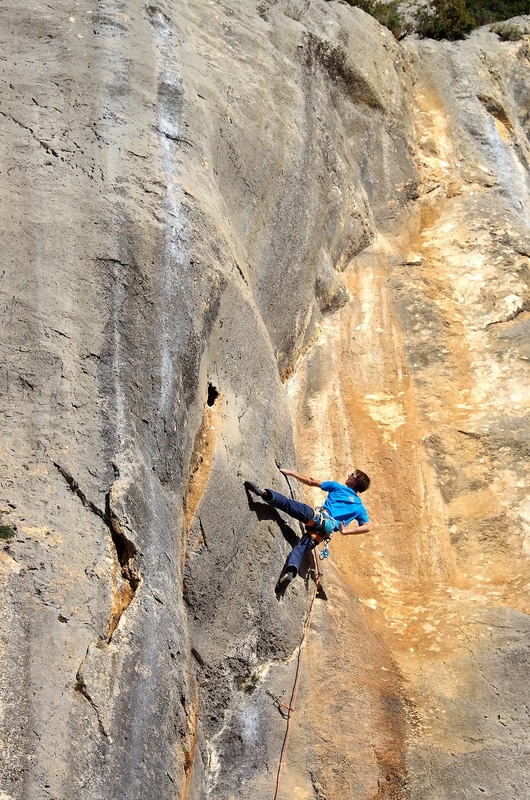 In one week they did ten first ascents from 7b+ to 8c and bolted seven new 50m lines from 7a to 8c+. 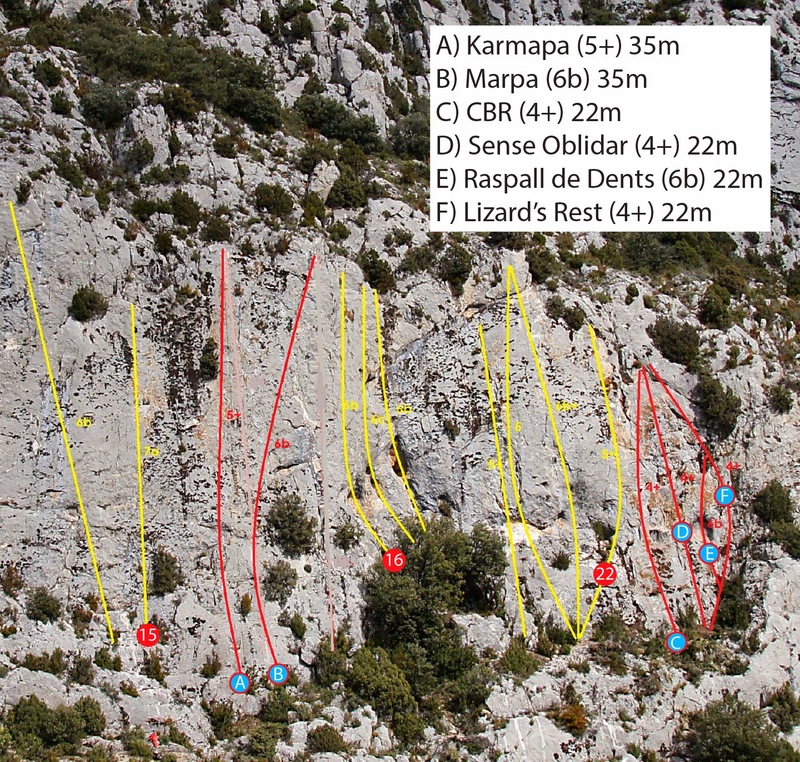 They also tried four projects (8c+/9a?) but for these, as Enzo Oddo puts it…they’ll have to come back!! 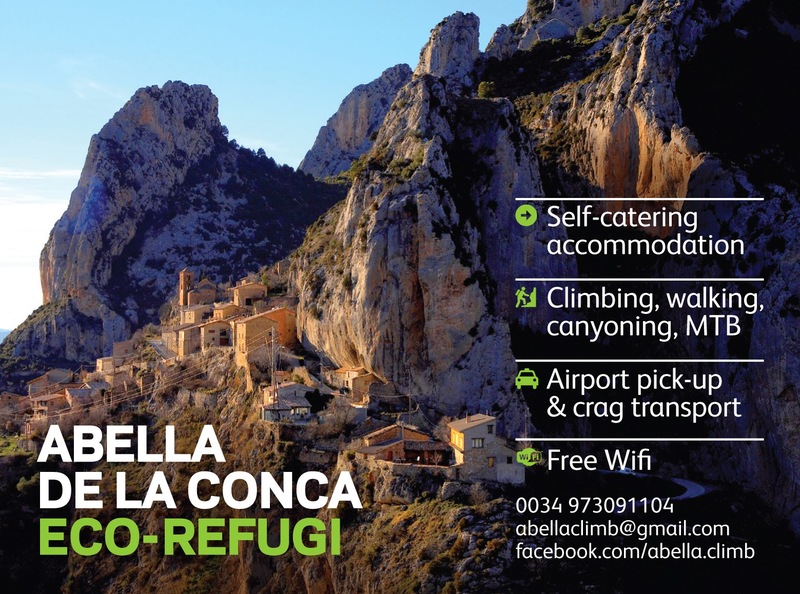 The new web site http://www.abellaclimb.com will give you more information about this crag and has online topos of the new sectors. 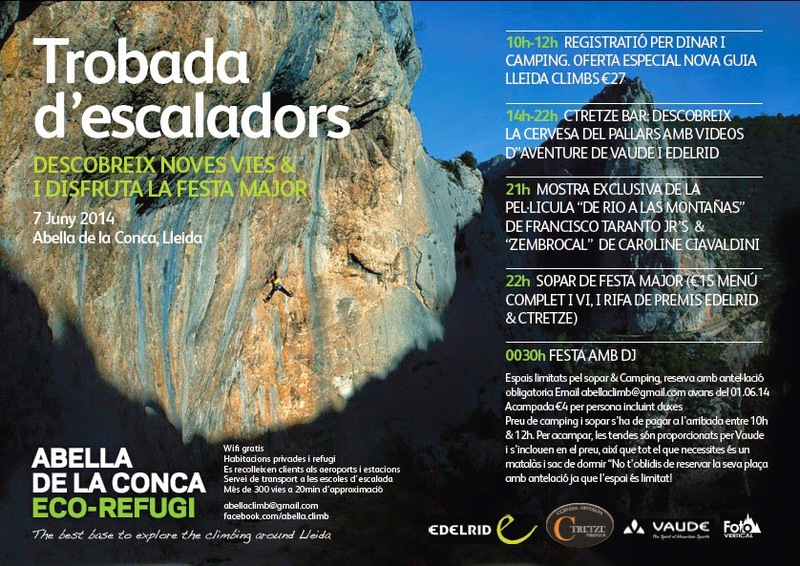 Este verano Caroline Ciavaldini , Enzo Oddo, Kevin Aglae, Klemen Bečan, y James Pearson han escalado en el guapísimo catalán pueblo de Abella de la Conca durante la trobadada organizada con Edelrid & Vaude . En esta zona se puede escalar todo el ano sobre una roca tipo Verdon. 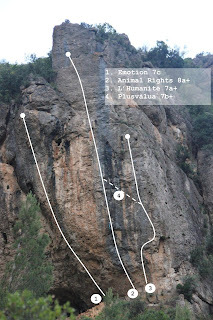 Dentro una semana han hecho las primeras ascensiones de 10 vias incluso dos 8c, y equipado 7 nuevas vías brutales de 50m de 7a hasta 8c+. 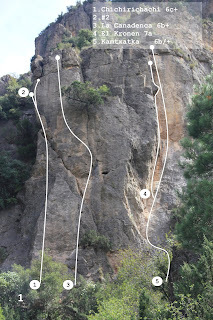 Han probado también 4 proyectos (8c+/9a?) pero para estos como Enzo Oddo lo dice al final…hay que volver!!! La nueva pagina web http://www.abellaclimb.com os permite buscar más información y topos para los nuevos sectores. 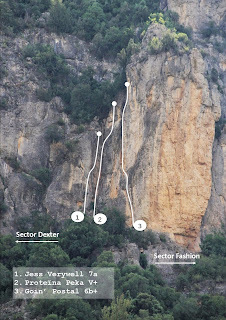 Yesterday we replaced a dangerously worn lower-off at the top of Viagra (6b+) and Michumi (6a+) at La Selva in Camarasa (Page 63 in Lleida Climbs 2). Even though the karabiner on the old lower-off unit was halfway worn through (see picture) it seems that people have been happily using it until very recently. This is madness! These two routes are extremely popular and it's likely that the karabiner was also regularly used as part of top-rope setups — a practice that should be avoided at all costs. 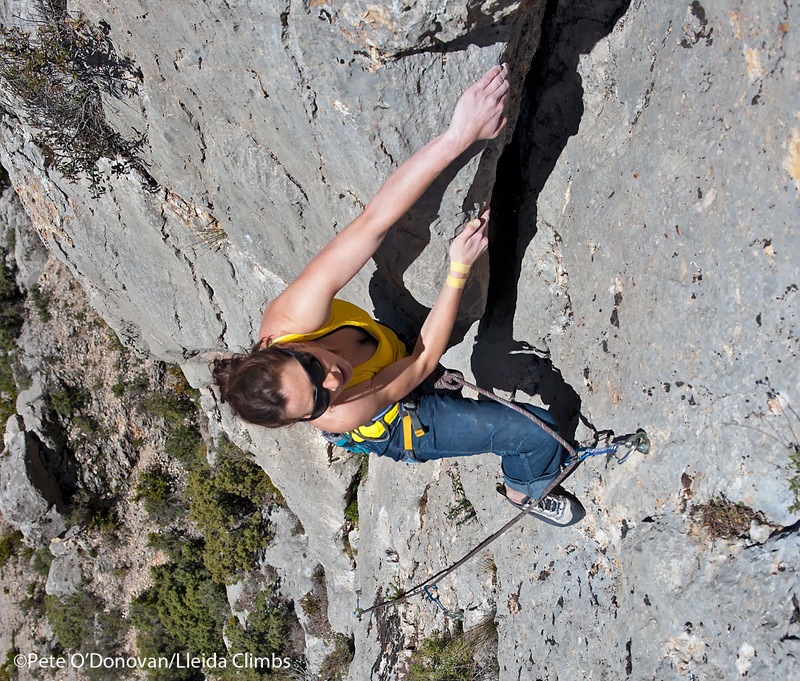 As we stress in the introduction to the guidebook, climbing in Catalunya is not a regulated activity. There is absolutely no structure in place to inspect or maintain in-situ gear. What this means in practice is that when trusting your life to in-situ bolts and lower-offs you must use your own judgement as to their dependability. 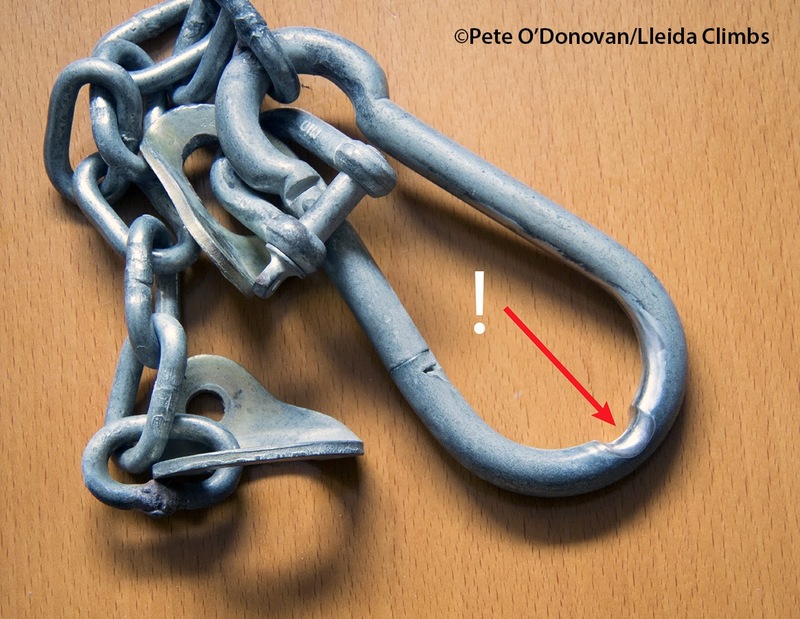 If a lower-off looks dangerously worn (such as this one) then leave one of your own karabiners behind — it's a small price to pay for peace of mind! 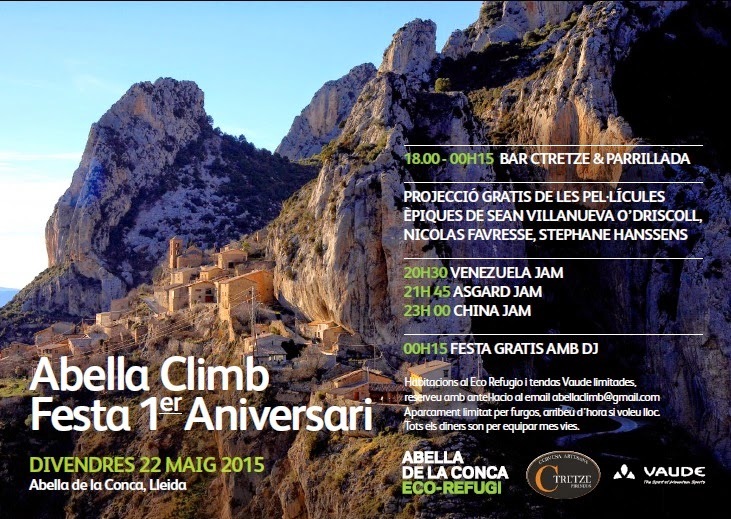 Come along and join the fun in Abella de la Conca on Saturday June 7th! 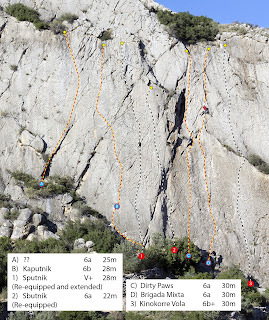 Albert Cortés and friends have equipped three very nice new climbs on sector Capricho de Vicho (Pages 48-49 in Lleida Climbs 2) situated around the pillar of 'Esbolon'. 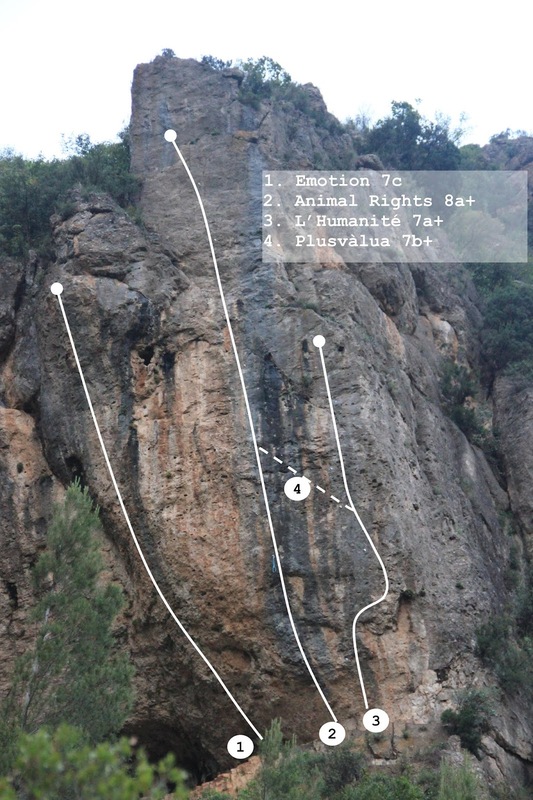 On following topo the new routes are denoted as A, B and C.
The project 'Tuk Tuk' (Page 46 of Lleida Climbs 2) has now been red-pointed by local climber David Espinet. The previously estimated grade of 8a has been confirmed. Araceli Segarra on 'Crackistan' (7a) Cingles de La Llum, Camarasa. 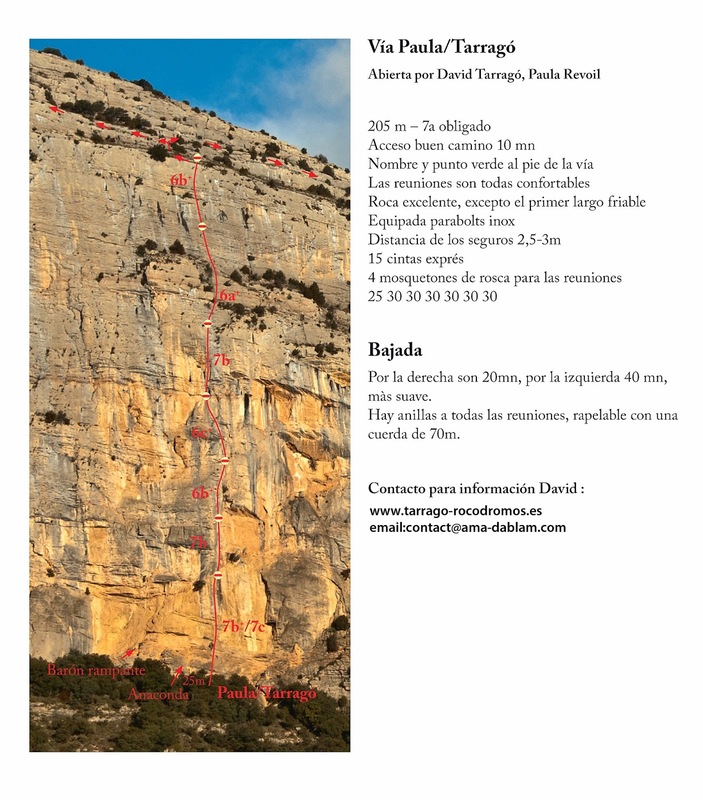 David Tarragó has sent us details about a new multi-pitch climb on Roca dels Arcs in Vilanova de Meià, equipped by himself and Paula Revoil last year. 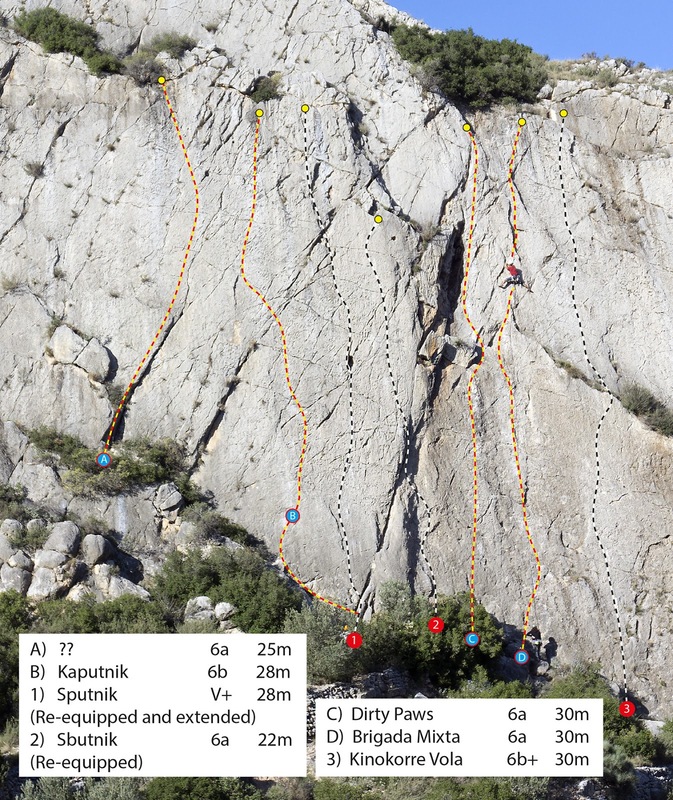 The route Via Paula/Tarragó is 205m long and features sustained climbing up to 7b+/7c, making it probably the most difficult multi-pitch climb in the entire zone. It is also reportedly excellent! 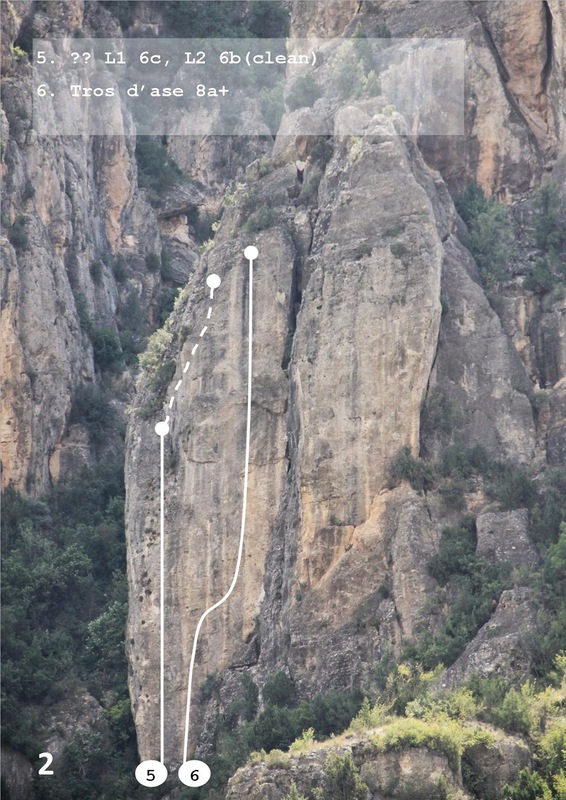 The section of cliff on which the route lies is not covered in the Lleida Climbs guidebooks. 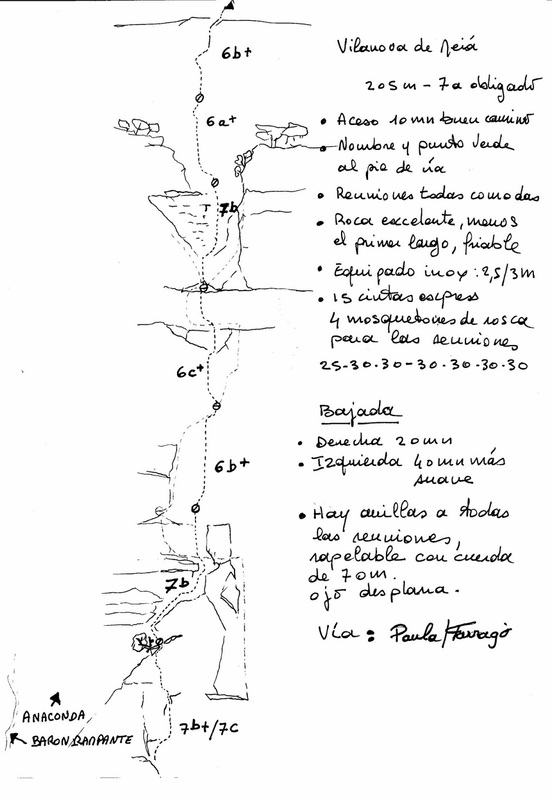 The route lies approximately 200m right of Papisuca (page 227 in Lleida Climbs 2). 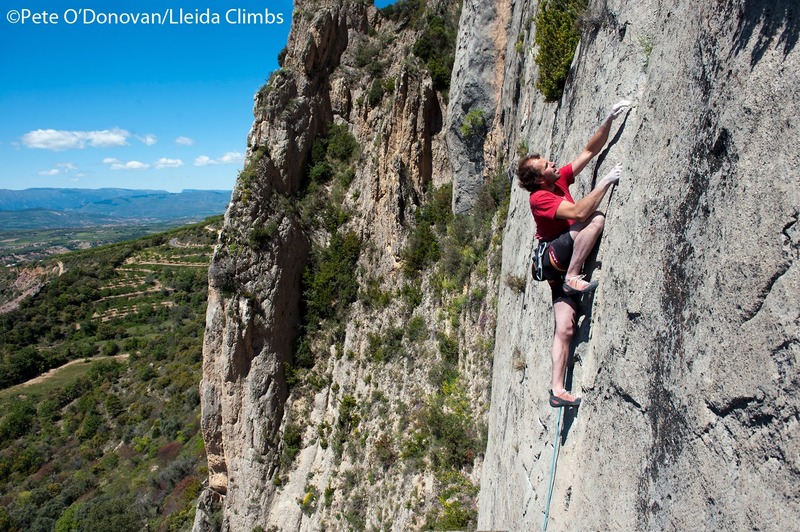 Stop press: we are pleased to announce the release of the second edition of Lleida Climbs! The second edition features 424 pages — 88 more than the first book— and lists almost 50% more routes. Many of these are situated on newly developed sectors in zones such as Camarasa, Alòs de Balaguer and Abella de la Conca. We would like to point out that proceeds from the first guidebook — both from advertising revenue and sales of the book itself — have played an important role in financing development of many of the new sectors, and would like to extend our sincere thanks to all our sponsors and customers. Lleida Climbs, 2a. edició !! Últimes notícies: tenim el plaer d'anunciar-vos que acaba de sortir a la venda la segona edició de la guia Lleida Climbs ! Aquesta segona edició, té 424 pàgines - 88 més que l'anterior - i inclou almenys un 50% més de vies. Moltes d'aquestes se situen en sectors totalment nous en zones com Camarasa, Alòs de Balaguer i Abella de la Conca. Voldriem destacar que gràcies als guanys de la primera edició - ja sigui per la publicitat inserida o a les vendes de la guia - hem pogut finançar l'equipament de molts dels nous sectors que us oferim, i voldriem donar les gràcies i el més sincer agraïment als nostres sponsors i compradors de la nostra guia. Lleida Climbs, 2a. edición !! Últimas noticias: tenemos el placer de anunciaros que acaba de salir a la venta la segunda edición de la guía Lleida Climbs ! Esta segunda edición, tiene 424 páginas - 88 más que la anterior - e incluye al menos un 50% más de vías. Muchas de estas se sitúan en sectores totalmente nuevos en zonas como Camarasa, Alòs de Balaguer y Abella de la Conca. Quisiéramos destacar que gracias a las ganancias de la primera edición - ya sea por la publicidad o por las ventas de la guía - hemos podido financiar el equipamiento de muchos de los nuevos sectores que os ofrecemos, y quisiéramos dar las gracias y nuestro más sincero agradecimiento a los spónsores y a los compradores de nuestra guía.